Who knew chicken can marry tofu and they can create such a fine family? They are perfect for each other and produce wonderfully flavored dish with awesome texture. Their kids can be quite versatile. 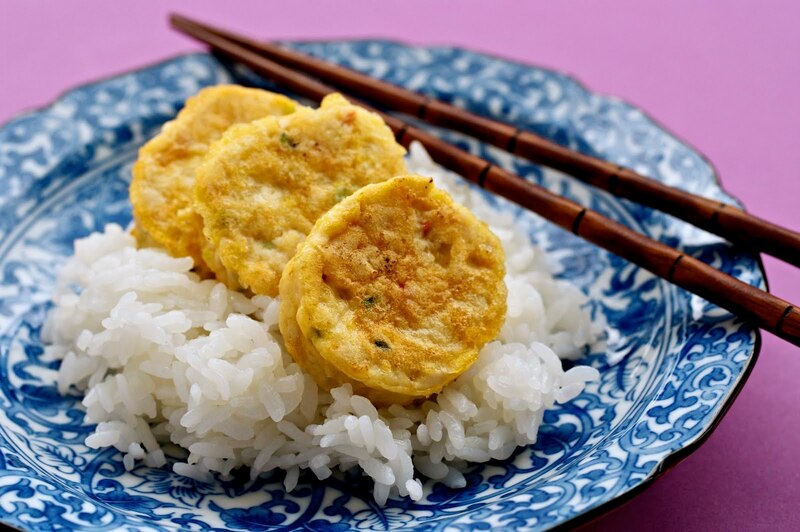 They can serve you as appetizer, a meal with rice, or even as chicken tofu burger with bun. What’s your choice? Introducing the bride and bridegroom with their best men and women. 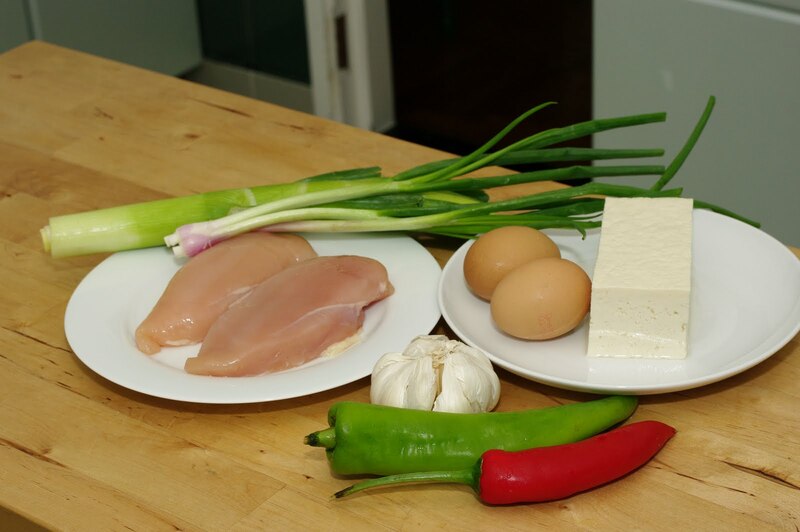 Chicken breast, firm tofu, leek, green onion, eggs, red and green chili, garlic. 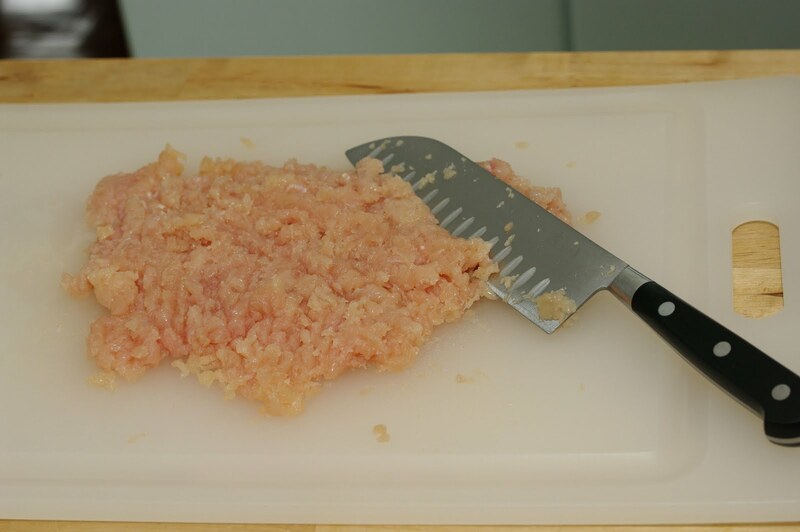 First, chop chicken breast with knife. You can use prepacked minced chicken. I just like to work out on my biceps by chopping myself. Mince the veges as fine as you can. 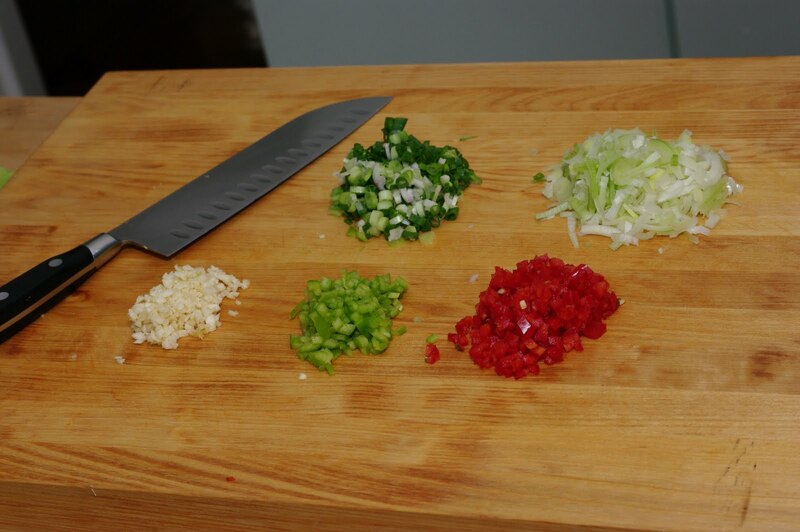 The leek can be sliced a little bigger than others because he is a macho. 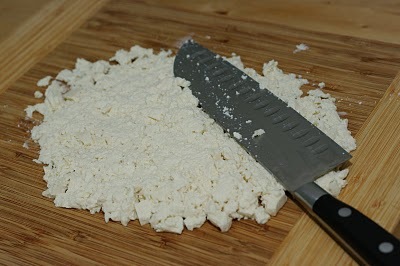 Smash the tofu with side of your knife. This is firm tofu and She needs to loosen up before the wedding. 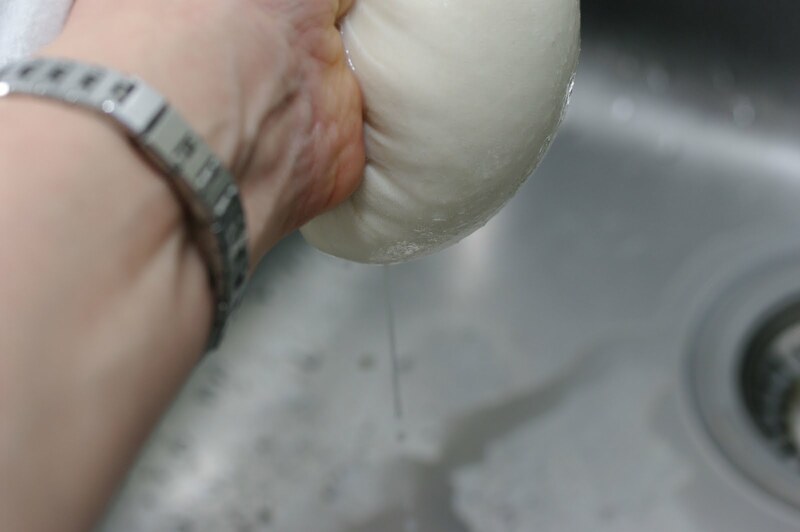 Place the tofu on the cotton cloth and squeeze out as much water as you can. Don’t be shy on this part. 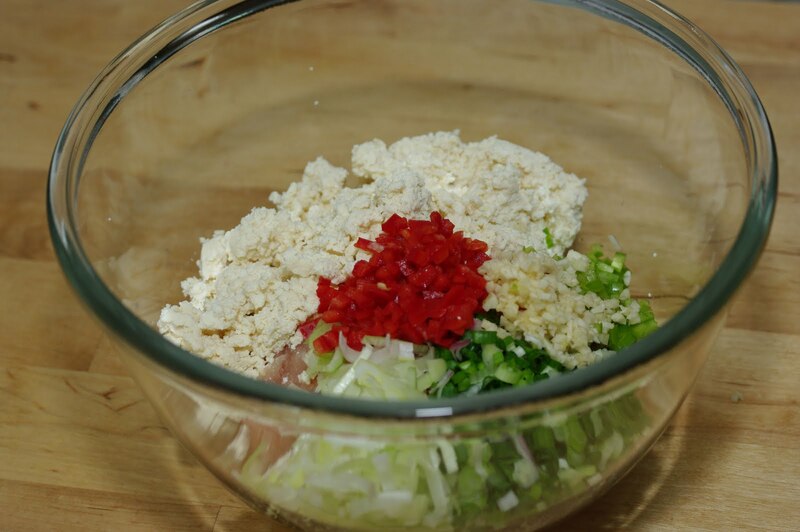 Now, Put all the main ingredients in the mixing bowl and add 1 egg yolk, rice wine, soy sauce, sesame oil, sugar, and salt and pepper. Mix them very well with your hand. This is a wedding party and you gotta have fun with it. 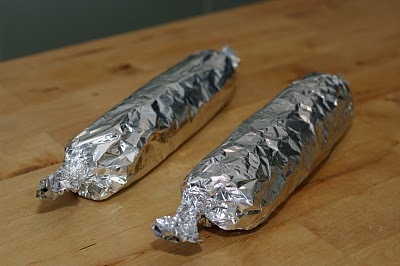 Get 2 pieces of foil and spray with oil. 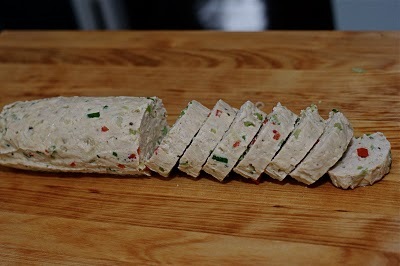 Place chicken tofu mixture on each foil making log shape, about 2″ in diameter. 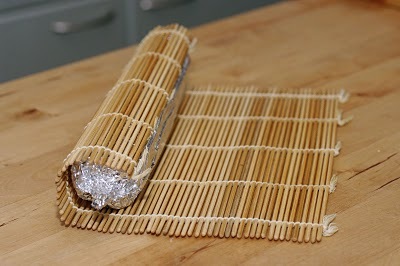 Roll the foil cover tightly pinching each ends to secure nothing runs out from the edges. If you have the tool above (It is a bamboo roll typically used in making sushi), use it to round up the shape and secure the tightness of the log. If you don’t have it, that’s the end of the road for you!…just kidding. 🙂 You can ignore this step. Now this is the honeymoon part of marriage. 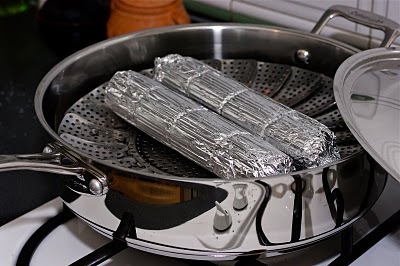 Place the logs on the steamer in the shallow pan and add a little water on the bottom. Cover the lid. You are going to give them a nice steam bath for their honeymoon. Just about 10 minutes on medium heat. Look at this beauty! They can be quite hot right out of pan…of course they just had their honeymoon!…so make sure you cool them down a bit before you open the foil cover. Cut each log into 1/2″ thick slices. Mine yield about 15 slices on each log. I ate the end pieces as I was taking this picture and they were so yummy! Coat each slices lightly with flour and egg. Heat some oil in non stick pan on medium heat. Brown the patties until just golden brown. That’s it. All finished. I had 30 patties made and ate about 6 of them during photo shoot session. Once upon a time a chicken married tofu. They had 30 little golden children and they lived happily ever after. THE END! I served these patties with some rice to my family and they loved it. 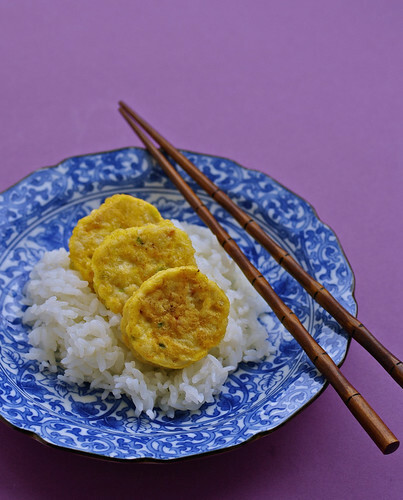 Here is some creative ideas that you can utilize this dish. 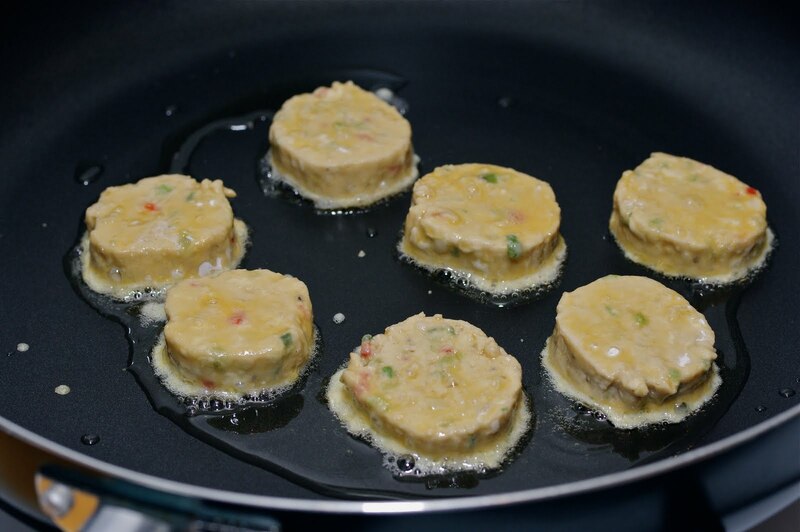 Instead of steaming process, you can make them into big patties like hamburger patties, coat with flour and egg, and fry them in the same way. It will take longer to cook and the color will be darker but they will make gorgeous chicken tofu burger with some lettuce & and tomatoes. 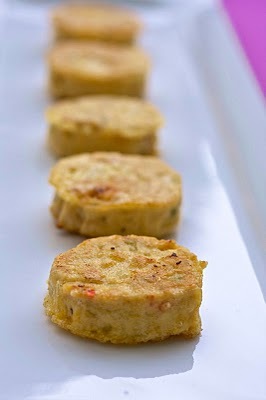 Or just serve these little mini patties warm as an appetizer. They are perfect to bite on. 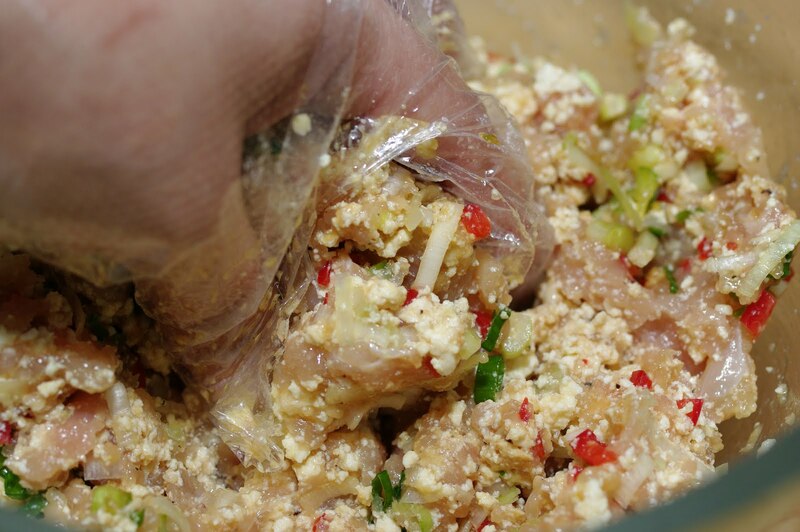 Chop chicken breast finely with knife. put in a mixing bowl. Smash tofu with side of you knife. Place in a cotton cloth and squeeze out as much water as possible, and add to the bowl with chicken. 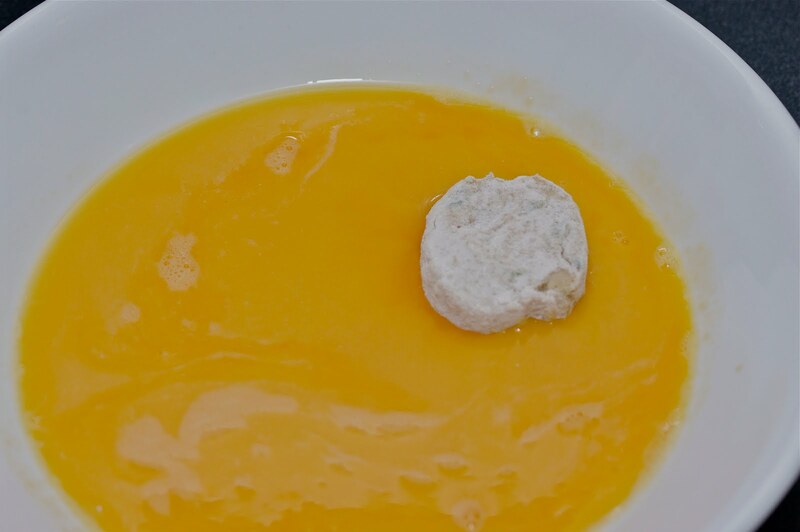 Add the the rest of mixing ingredients in the bowl and mix them very well with hand. Spray 2 pieces of foil with oil. 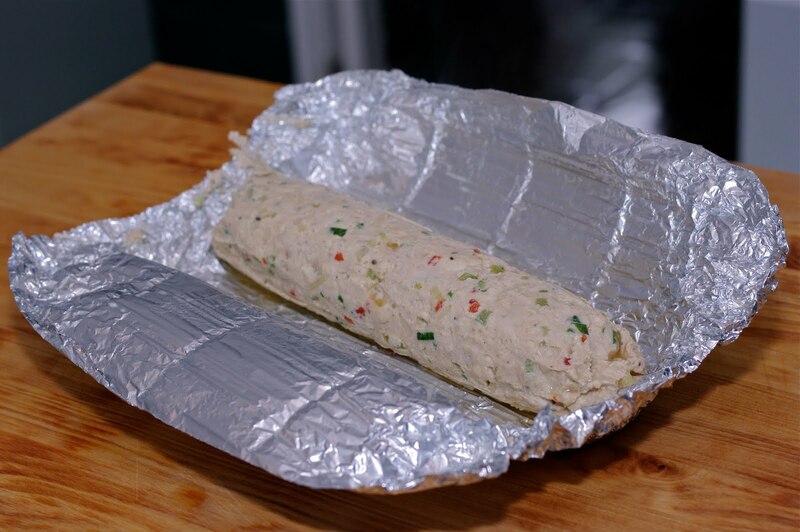 Place half of chicken mixture on each foil making log shape, about 2" in diameter. 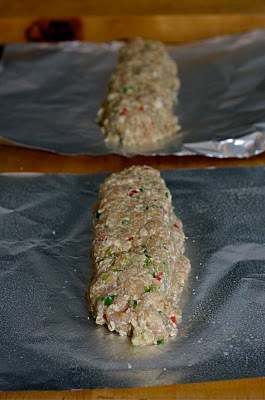 Tightly cover the mixture with foil and pinch each ends to secure. 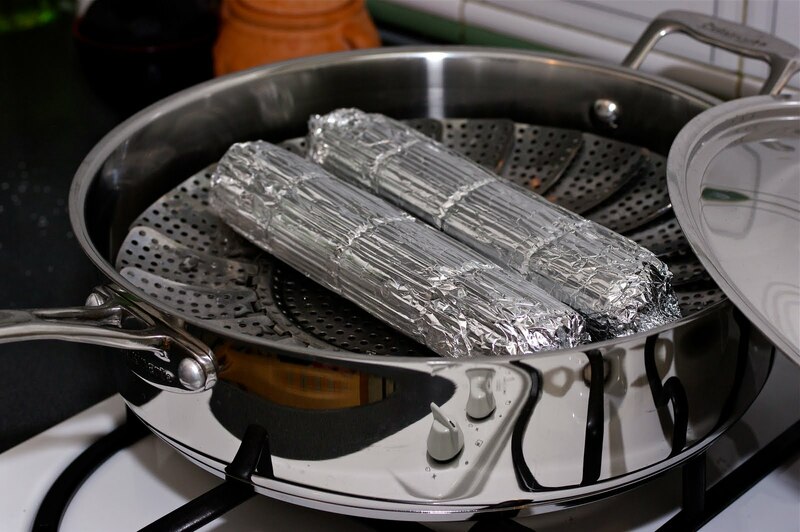 Place the logs on the steamer in a shallow pan. Pour a little water and cover the live. Steam the logs over medium heat for about 10 minutes. Unfold the cover and cut each logs into 1/2" thick slices. It will yield about 13-16 slices on each log. 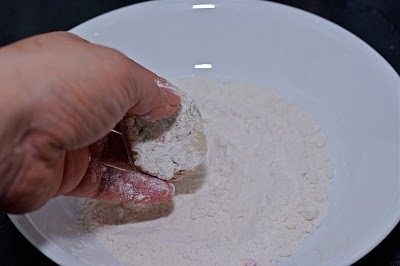 Coat each slices with flour and then egg. Fry them in a little oil on nonstick pan on medium heat until golden brown. Wonderful! You write so well! Beautiful pictures too. This is awesome. I will definitely try this out! my grandma would go straight from the mixture to shaping the individual patties (as you mentioned in the text), coating with flour&egg;, then frying. But by making the log and steaming it before hand, the shape seems to hold better! what a clever idea! this 동그랑땡 is always a hit with the little ones! They love them with little dollop of ketchup. This is brilliant!! Thank you so much for the recipe. I would definitely try this. No more 동그랑땡 from the market!! Looks so tasteh tasteh *. * im just so sad cuz i cant buy korean ingredients in my place, even online they dont make shipping to my place, am gonna cry now T^T. Good job on that looks great! That looks wonderful! Think I will try this soon since we have so much chicken. Just need the Tofu. They are really tasty. Hope you an give it a try soon. I made this for my daughters 100 day party... Wow! They were a hit, thank you for sharing this awesome recipe!! I liked it even better than the beef version. Only changes I made was use a red bell pepper instead of hot peppers and we fried them with rice flour and no egg due to allergies. Steaming them was such a genius idea! I was able to steam them the night before the party and fried them up the next day. Such a time saver. Thanks again. Thanks Soo. Glad to hear that they were hit. Ever since I was introduced to Korean Dramas in 2009, by my favorite grad school professor, I've wanted to try the little meat patties. I see people eating them all the time on the shows. After finding your website/blog, which is creative, beautiful, and delicious, I made the patties this evening! 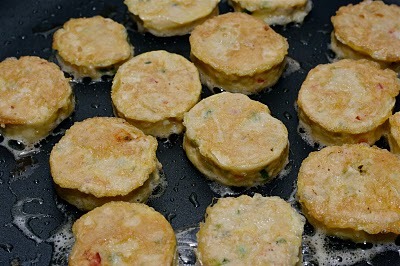 My children loved the chicken and tofu patties. I cut the chilies in half and they were perfect for the kids. I am going to make them again tomorrow with extra chilies for my husband, in-laws, and myself! Thank you for the easy to follow directions, with captioned photos! Hi Miya I guess Korean dramas are quite addictive! Thanks for liking my chicken patties. They take some time to make but so good! I am glad that your kids liked them. Hope your husband and your in-laws will like them, too. Have a great day! Can you make a big batch and freeze these? Of course! You can make the whole batch and freeze them. Just thaw in a room temperature. You can heat them up in a skillet with a little oil if you desire to serve them warm.